Property 20: Surrounded by nature, is the ideal starting point for picturesque routes. 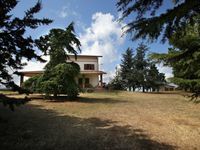 Property 39: Stunning views from this beautifully located house in the heart of Calopezzati. Property 44: Casa Nina, independent apartment with terrace. We stayed in this villa during the month of July 2016 and enjoyed ourselves immensely, gazing from the veranda to the sea and swimming in the remarkably calm and clear waters. Friends and family visited during this time and our group was periodically as large as seven, which the house accommodated very comfortably. The views are stunning - to the sea, to Sila National Park, across the valley to the distant villages. The peace and quiet were precious, though Corigliano Calabro is only 15 minutes away by car, and the beach another 15. Angela and Peppe were always just a phone call away with suggestions for places to visit, things to do and solutions for minor problems. This place is a treasure trove for lovers of history and culture, as well as swimming and eating local fish, fruit and vegetables. Shopping at the small markets and fruit stalls was a fun chance to interact with the vendors. The people of Calabria are warm, welcoming and relaxed. The countryside - mountains, rivers, valleys, fields - is beautiful. The food is delicious, we had great meals in all the restaurants, even the cheapest, and we cooked very well with the produce we bought. The large kitchen is well-equipped (though we did miss a good cooking knife). Sluggish internet reception curtailed our use; not necessarily a bad thing :-). If you do not drive or are unwilling to rent a car, this place is not for you. Other than that, it's perfect. We will stay there again.